To take advantage of the full potential of this modification, you should install an any mod that allows you colorizing wool. I recommend Technic or Woolcraft mods. Crafting recipes - see README.txt for ordinary blocks and More Blocks thread for stairs, slabs, panels and micros recipes. Last edited by Ragnarok on Mon Feb 11, 2019 11:12, edited 6 times in total. Nice! +1 need to install it, does it need streets? or can be installed w/o that? Does it contains all items from streets, or only is based on it? Last edited by BZab on Mon Feb 18, 2013 16:56, edited 1 time in total. You do not need to install streets. Items are the same, almost all with variants like stairs, slabs, panels and micros supported by stairs+ mod. Moreover there are few improvements over the streets mod: redefined models, additional elemens and emergency phone is automatically placing on post. Last edited by Ragnarok on Mon Feb 18, 2013 16:53, edited 1 time in total. Implemented traffic lights. There are two kinds of lights: lights for vehicles and pedestrians. The last probably will be changed to textual lights (if I fit a texture). From now mod wil be depending on mesecons. 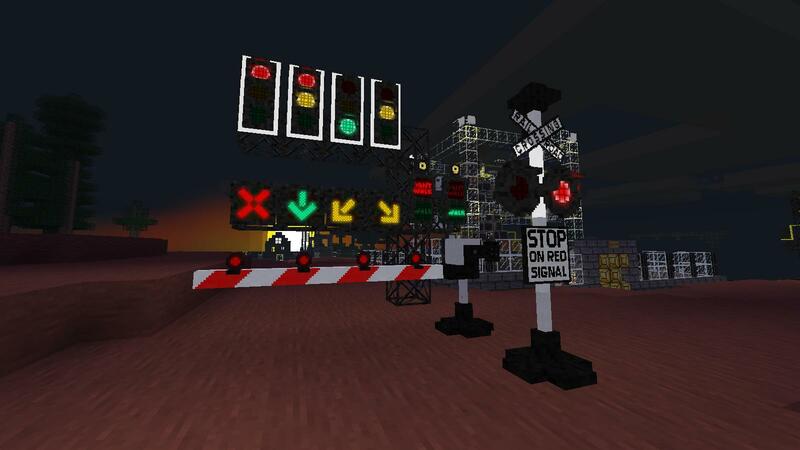 In near future I plan to add beep sound for pedestrians traffic lights. Over the lights is a small, protruding device - this is a speaker, so... you know ;) Another chellenge is to make countdown timer for vehicles. Last edited by Ragnarok on Tue Feb 19, 2013 23:47, edited 1 time in total. Last edited by BZab on Wed Feb 20, 2013 15:23, edited 1 time in total. Last edited by Ragnarok on Wed Feb 20, 2013 22:42, edited 1 time in total. I added two kinds of beep sound for traffic lights (pedestrian crossing) and a dial tone for an emergency phone. Finally I made advanced warning device for railway crossings. Its 4 nodes high and 3 wide, so be carefull. Next target is boom barrier. Last edited by Ragnarok on Mon Feb 25, 2013 11:24, edited 1 time in total. Hey Ragnarok, wheres the cars? Seriously speaking: maybe you'll produce them? Roads are already. I've just made railroad crossing boom barrier. I'll add screenshots later. I was thinking add cars but, I don't know if it will work, and I don't know how make the models work. The plesure is mine :) You inspired me. Maybe useful will be UFO mod or boats code? Yep, I know it. Boats and cars magically dissappearing too. BTW I updated the mod. There are new traffic barriers: corrugated band and a "widow makers". I added flashing curve chevron today. Controlled by punch and mesecons. 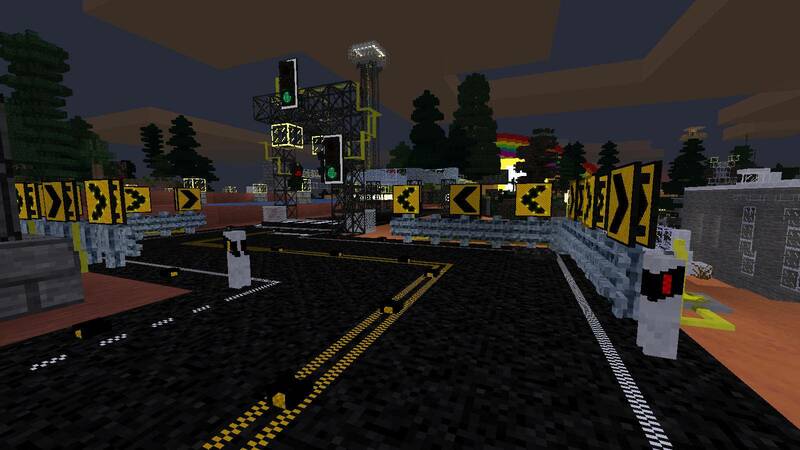 I added lane control lights and Fitch barriers. Where is the Stairs+ mod? The link in the description doesn't work and I can't seem to find it anywhere, even via Google. EDIT: Never mind. I see it is a part of Moreblocks. Last edited by gnagy42 on Thu Mar 28, 2013 03:38, edited 1 time in total. gnagy42 wrote: Where is the Stairs+ mod? The link in the description doesn't work and I can't seem to find it anywhere, even via Google. Stairs plus is now apart of moreblocks mod. Thanks guys. I fixed link in first post but there is few things to do and Infrastructure doesn't work properly yet. I'll do it as soon as possible. Last edited by Ragnarok on Thu Mar 28, 2013 12:31, edited 1 time in total. I'm glad :) I updated mod - there is two, new elements: anti-glare board and noise barrier.